Since becoming Catholic, I have been asked numerous times “why?” “Why are you doing this?” Many Catholics have asked with excitement in their voices, and my non-Catholic family and friends have asked with dismay. Interestingly, no one asks void of emotion. While speaking with a friend who recently converted, I told him about my mother’s belief that the Catholic Church is Satan’s greatest triumph in all of history. He replied, “It has to be either Satan’s greatest triumph, or Christ’s greatest triumph. There is no neutral ground when it comes to the Catholic Church.” Truth. The same applies to people I talk to about my conversion; there is no neutral ground. They are either excited or dismayed. So what led to this decision? Often, when I try to tell this story, it is too overwhelming. How do you describe eight years of reading, discussing, listening, and journeying? My worldview gradually shifted, and it is difficult to put into words what happened in my mind and my heart. However, there are a few landmark times in my journey that I will try to highlight. I grew up Baptist — and all that encompasses: sola Scriptura (Scripture alone), sola fide (faith alone), church on Sunday, devotions in the morning, prayer before bed, and memorizing Scripture. While my faith wavered at times (especially during the high school years), I went on to attend a small, Baptist college where I had a moment in which I “rededicated” my life to Christ. It was here that I started dating my husband, Nick, who is a passionate man with a love for theology and discussion. We were Calvinists and defended all the Baptist teachings. I will always be grateful for my upbringing; I was taught to value Scripture and have a personal relationship with Jesus Christ. I was surrounded by people who loved the Lord and desired to share His love with others. Once married, Nick and I attended the local Baptist Church for several years where we were involved in the AWANA program. It was here that our journey began. We started to be frustrated with church. It seemed that church was “good” if there was a sermon packed with knowledge and we learned a lot, and “fruitless” if the sermon wasn’t very good. Looking back, I realize that when you attend a church without liturgy, everything focuses on the sermon, pastor, and how you feel during worship. We were frustrated with ourselves, because we wanted to enjoy church and worship God, but we didn’t want to be critical. After much prayer, we decided to leave and find a church that better suited us. That was a very difficult year for us, as we attended a new church almost every weekend. Saturday night, we would get out the directory, and look for a church that we would test out the next day. Although this was an emotionally draining time, as we both wanted to be settled in a church, it was a very important time in our lives. We were forced to ask questions: What is church? What is the purpose of church? What makes a church “good” or “bad?” As we evaluated churches and ourselves, our answers to these questions gradually changed. We realized that church was not about what we intellectually learned during the sermon and what emotions we had during singing, but that we were going to ascribe worship to God through liturgy. We were to be giving ourselves to God in a way that is greater than what we learned or felt. We shouldn’t sit back as a critical audience with our coffees and consume; we were to participate in something larger than us. It shouldn’t matter if we didn’t like the sermon or not. It wasn’t about us. It was about worshipping Christ by participating in liturgy with a community of believers. It took a long time to come to this conclusion. During this time, we were reading, studying, and discussing all of these issues with friends who were going through the same things we were. We had friends who entered into the Reformed world, the Anglican world, and some who converted to Catholicism. We settled at a very conservative Episcopal church, which was run by a priest who had Anglo-Catholic inclinations. During the four years that we were here, our reading and studying continued. We were introduced to liturgy, prayers to the saints and Mary, the Daily Office, the liturgical calendar, Church history that finally made sense through a belief in Apostolic Succession, and really a “Catholic” spirituality. It was at the Episcopal church that a large pillar from our Protestant upbringing was struck down: the doctrine of sola Scriptura, which is the key to Baptist theology. Throughout our searching, I found that I could no longer rely on sola Scriptura. I had been taught my whole life that everything you need to live the Christian faith could be found in the Bible. Though this may work in theory, it doesn’t work in practice. I realized that I had relied on people’s interpretation of Scripture, influenced by their own cultural assumptions, philosophical perspectives, and family upbringing. I spent much of my college Bible education learning the “right” way to interpret Scripture. If I just knew the Greek and Hebrew words, consulted enough concordances, and looked at the context of the verse, the correct interpretation could be found. Then why are there still disputes? That question was always answered by saying that we may disagree with peripheral matters, but the core beliefs are the same. I could live with that (never mind that I was seeing my close friends and families’ churches dividing over issues of doctrine, each thinking they had the truth). I couldn’t help but think, if these were only peripheral matters, then why were whole churches dividing? I just shook my head and resigned myself to the idea that this was how church was supposed to be — there were pastors and intellectuals who knew more than me and who were working these issues out. However, when our first daughter was born I could no longer ignore these problems. Nick and I were confronted with the issues of infant versus adult Baptism and the necessity of Baptism for salvation, both controversial and deep. I had been taught my whole life the concept of “believer’s baptism” as an outward sign of faith and not necessary for salvation. But what if that belief was wrong? The church we were attending used the Bible to say something different than what I had previously been taught. I wanted to know what the Bible said, not any person’s interpretation. I turned to the Bible and found it difficult to answer the questions I was seeking. The only clear thing I found after reading many passages about Baptism was John 3:5, “Jesus answered, ‘I tell you the truth, no one can enter the kingdom of God unless he is born of water and the Spirit.’” That seems to indicate that Baptism is necessary for salvation. This was no longer just a peripheral issue. I was dealing with the soul of my child. I looked into the arguments for and against infant Baptism, and found that they both had great biblical support. If the Bible alone is sufficient, then why could I not find the answer to a vital and core issue? I realized that sola Scriptura doesn’t work in practice; yet, at the same time, I was not giving up in my search for answers. With sola Scriptura no longer tenable, I had to look somewhere else. I chose to look to what other Christians throughout time said; I had to look to history. What I found was fascinating and helpful. Christians have practiced infant Baptism since the beginning. It wasn’t until the turmoil of the Reformation that this core practice was disputed in a serious way! Even the Reformers fervently disagreed with one another, yet they were all appealing to sola Scriptura. Could I really argue that all Christians were wrong prior to the 1500s? Our first two daughters were baptized at St. Mary’s Episcopal Church, much to the dismay of our families. The pillar of sola Scriptura had fallen, and we were left with relying on Tradition or our own individual interpretation of what we thought Scripture was trying to say. As we attended St. Mary’s, Nick was devouring book after book on Church history, and the Catholic Church. He is a history, literature, philosophy, and theology teacher so these issues struck right at the heart of his daily work. We started to see the tenuous, tumultuous, and dare I say, presumptuous nature of Protestantism as our eyes were opened to the wisdom of the ancient Church. How could these Reformers and new groups of Christians claim truth over all of the Church Fathers and previous 1500 years of Church history? Through reading and research, I came to realize that many of the core beliefs that I held as a Protestant weren’t actually found in the Bible, they were worked out during various Church councils throughout history. The canon of Scripture, the doctrine of the Trinity, and the hypostatic union (Jesus being fully man and fully God), were all issues of doctrine that I was taught, and they were formulated and given to us through the Church, using the Bible as a guide. As a Protestant, I was already relying on what I now call, as a Catholic, Sacred Tradition without even knowing it! It was a relief to know that God’s revelation to us is not confined to the written page. Time and again I found the same pattern with core issues as I found with Baptism: the “Bible alone” was not sufficient, but only with Sacred Tradition. Tradition is a beautiful gift given to us by God to help us live our lives. It is meant to work with the Bible, not in contradiction to the Bible, and it only works as the Spirit guides the Church as Christ intended it. The Church gives stability to our lives and authoritatively interprets the Bible. God in His infinite wisdom and love has given us a way to know what He’s revealed, a living and active, dynamic and authoritative voice, the voice of the shepherd for His sheep. I think of this as the last “landmark” in our journey – answering that piercing question – “why are you not Catholic?” We were living a Catholic life, just void of the papal authority and the Eucharist. Due to a move, we were attending an Anglo-Catholic church that believes in all the Church teaches except for the authority of the Pope. They believe in all seven sacraments and celebrate a beautiful and ancient liturgy. I had read through the Catechism several times and didn’t disagree with anything in there. All the dominoes of “Catholic problems” had fallen: Mary, prayers to the saints, Eucharist, infant baptism, etc. The last and final question for us both was the question of authority. Does the pope have authority? More importantly, do I have to submit to the authority of the Catholic Church? We were both coming to realize that we were still living in the Protestant world of picking and choosing what you want to believe and do with your life. The individual was still the authority. I’ll never forget the moment I decided to become Catholic. I was pregnant with our third child, and had recently moved, meaning a switch in pediatricians. As I was transferring all of our medical information to the new office, I was confronted with the controversial issue of immunizations. There lots of opinions and dogmatic people on both sides of the issue! My girls were both about half-immunized. I was doing quite a bit of research to decide what we were going to do and Googled “Christian perspective on immunizations.” Nothing good came up. Frustrated, I changed it to “Catholic perspective on immunizations.” I was transferred to an article from the Pontifical Academy for Life that was extremely helpful in considering the morality of vaccinating your child. This was ten times more informative than anything that I had found. It listed the vaccines that are made from aborted fetuses and addressed the ethical decisions a parent must make to protect the greater good of society, our children, and the unborn. It didn’t give an exact answer; it gave a framework with which to think about the issue. It was practical, nuanced, thoughtful, and right. I was driving to the YMCA, thinking about all of my research, and chuckled to myself, and literally thought, “Those Catholics, they got it right again. They’re always right.” Then, “Whoa! 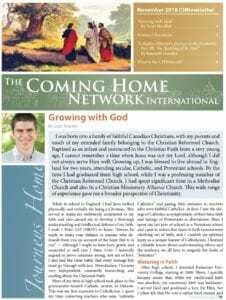 They’re always right.” Tears came to my eyes, and it was at that moment, I knew I had been moved by grace to come home to the Catholic Church. So many times I had asked: Where is Christ’s “voice” in our world? I know Christ is always present and relevant despite all the changes the world goes through and of course He is in many Protestant denominations that are doing excellent work. Billy Graham and Focus on the Family have amazing ministries that touch millions of people. Many individual Protestant churches work extremely hard at various ministries, but the fact is, there isn’t a unified, Protestant voice; there can’t be as all of the churches aren’t unified under one authority. As I looked into Catholicism, I found that the Catholic Church has taken a unified, moral, and authoritative voice against abortion, homosexual marriage, birth control, euthanasia, cloning, and has worked for relief of the poor, widows, orphans, and for social and economic justice. The Catholic Church still has a voice in our world. When the Pope speaks, the world listens. They may not agree, but what he says is heard and respected by the world. Our world desperately needs a voice, and we all need guidance at an individual level. We need someone saying, “hey, this is wrong!” I believe Jesus came to this world to save sinners and establish His Church as a refuge and outpost for His kingdom of peace, healing, and justice. He still speaks to us today through His Holy Catholic Church, offering us guidance and speaking to the world. Christ’s voice is not confined to a page, but is “living and active, sharper than any two-edged sword,” (Heb. 4:12) and I am grateful that He still speaks to us authoritatively today. I told my husband that night that I was ready to become Catholic. This was at an extremely hard time in our lives. We had just moved to a new town where he was starting a job at a Reformed school, teaching history and theology, and I was pregnant with our third child. We both knew that if we became Catholic, it would mean he would lose his job and we would have to move again. My husband wasn’t quite ready and for him as the provider our family becoming Catholic meant a lot more than just joining the Church, it meant losing his livelihood with three young children. It wasn’t long after I had made up my mind; he decided he was ready too. After resigning in the spring, we were jobless for a short time before God opened the doors to another teaching job at a little Catholic school where we used to live. Looking back, I am amazed at the eight-year journey God took us on to find His Church. It has been painful: we have lost friends who no longer want anything to do with us because of our faith. It is also very difficult for our families who feel that we have betrayed them and the faith of our childhood. As we adjust to these new relationships, I am thankful that I have the wisdom and guidance of Mother Church, the prayers of the saints and Mary, and the grace given by the sacraments. Gloria in excelsis Deo!